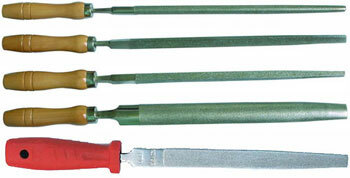 Diamond lozenge (slitting) hand files are used for filing slots or grooves. The files are parallel in width with identical contour on both sides. Each file has a smooth wooden handle. Electroplated diamond large hand files with several shapes. They are flat, round, square, triangular and half round. Wooden or plastic handle.